A Siddi girl from Yellapur District, Karnataka, India. The Siddis of Karnataka (Kannada: ಕರ್ನಾಟಕದ ಸಿದ್ಧಿಗಳು) (also spelled Siddhis) are an ethnic group inhabiting India. Members are descended from Bantu peoples from Southeast Africa that were brought to the Indian subcontinent as slaves by Portuguese merchants. There is a 50,000 strong Siddi population across India, of which more than a third live in Karnataka. 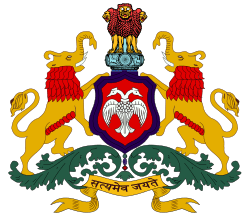 In Karnataka, they are concentrated around Yellapur, Haliyal, Ankola, Joida, Mundgod and Sirsi taluks of Uttara Kannada and in Khanapur of Belgaum and Kalghatgi of Dharwad district. 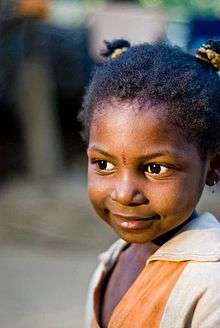 Many members of the Siddi community have migrated to Pakistan after independence and have settled in Karachi and Sindh. Recently, they have come into the limelight by Sneha Khanwalkar's soundtrack 'Yere' for MTV Sound Trippin'. There are various hypotheses on the origin of the name Siddi. One theory is that the word was a term of respect in North Africa, similar to the word sahib in modern India and Pakistan. A second theory is that the term Siddi is derived from the title borne by the captains of the Arab vessels that first brought Siddi settlers to India. These captains were known as Sayyid. The term seems to have found currency following a description in a letter written by one William aboard the S.S. Nepal, a ship that sailed from England to South India and Ceylon. In the letter he describes the crew of the ship as "composed of seven English quarter masters and forty three lascar seamen, six English engineers, thirty-five men (Muslim) and fifteen Sidimen or negroes for coal shifters." Similarly, another term for Siddis, habshi (from Al-Habsh, the Arabic term for Abyssinia), is held to be derived from the common name for the captains of the Ethiopian/Abyssinian ships that also first delivered Siddi slaves to the subcontinent. The term eventually came to be applied to other Africans and not only to emancipated Siddis. In time, it came to be used to refer to their descendants as well. It is sometimes pronounced "Hafsi" and is considered an insult. The majority of the Siddhis in Karnataka are descended from Bantu peoples from Southeast Africa that were brought to the Indian subcontinent as slaves by the Portuguese between the 16th and 19th centuries. During the Goan Inquisition, some of these slaves were freed and some escaped into the forests of the neighbouring Karnataka state. As the bulk of the Inquisition's records are now destroyed, a thorough reconstruction of the Siddhis' history in India and in Karnataka is very difficult. However, the few records that exist present a picture of oppression and ill treatment that the slaves were subjected to. A few of them, however, are also said to have escaped slavery. While most of them were victims of slave trade, some of them also were imported by the Nawabs in the 15th-16th centuries as military mercenaries. Others were sailors on the trade routes to the east. In 2013, the New York Public Library held an artistic exhibition entitled Africans In India: From Slaves to Generals and Rulers, which retraced the lives and accomplishments of prominent Siddis from the past. Lasting until July, it included 100 reproductions of paintings and modern photographs. Among Siddhi families in Karnataka, there are Roman Catholics, Hindus and Muslims. The Haliyal taluk has populations of Muslims and Christians while the Hindu populations are concentrated in the ghat areas of Yellapur and Ankola. Although Siddhis opt for different religions they inter marry across religions without any reservations. The one factor which binds the Siddhis, irrespective of their religion is the Hiriyaru or ancestor worship. The dead are believed to be nearby, in the form of spirits. They are regarded as witnesses to be consulted by a family in all its concerns. On occasions like births, marriages and deaths, the ancestors are invoked. The home is organised around Hiriyaru, the spirits of departed parents. It signifies a remembrance of the parents, thanking them for their care over several years and also entreating them to keep a vigil over the family in future. It is obligatory for all relatives to attend the function, thus renewing kinship relations. Hiriyaru worship may be performed twice a year by the 'Kartha'(head) of the family. It normally is held during the Navarathri festival in the first week of November. If this is not possible for some reason, it may also be performed in April–May during the other major festival - Holi. These obviously are not meant to coincide with the dates of the parents' deaths as the Siddis only observe the first death anniversary. Hindu Siddhis usually have elaborate functions to mark the event, but not so the Christian and Muslim Siddhis. Siddis mainly speak the Kannada language, which belongs to the Dravidian family. Some also speak other languages, such as Konkani and Marathi. Almost all Siddis today subsist as agricultural and casual labourers, contractual or in some cases bonded, some also work as domestic help. The earliest Siddhi settlers who fled Goa and entered the Karnataka forests of North Canara, made the forests their home and started cultivation. In some of the villages in these areas, they form the earliest settlers. The Siddis of Yellapur are very honest and hard working. Siddi Farmer in the fields of Yellapur District, Karnataka, India. A feature common to the Siddis of Karnataka, as also of those of Maharashtra and Goa, is that they exhibit a remarkable level of assimilation with local culture. This, in the absence of any form of force. Even the uniquely Siddi custom of Hiriyaru has adopted symbols from the local Hindu religion. Except for the racial characteristics of the tribe, there is little else that can set them apart from other native populations. Almost all the siddis in present-day India are mixed indo-African There are very few pure siddi populations in Karnataka today, most of the pure Siddi population living in Gujarat. Many of them have lost their original African names and culture however they have retained some forms of African traditions in the form of dance and music. There are references to Siddhi palace guards in Kodagu during the reign of Dodda Veerarajendra (1763–1809) in the Kannada book Kodagina Itihasa. An account by Rev. G. Richter in 1870 also makes a note of "African bodyguards" in the service of the same king. A Siddhi called Gajaveera is noted to have joined hands with Sangolli Rayanna in his revolt against the British in 1829–30 near Kittur. In the revolt of 1844 at Sawantwadi in the Ratnagiri district of neighbouring Maharashtra state, records show that two Siddhi brothers, Bastian and Benove, from Punsolli near Dandeli had been enlisted by Phen Sawant, a noble of the Sawantwadi court. The first notable act of this group seems to have been their looting of a British outpost during the Supa Uprising when they confiscated government funds, took many chaukidars (watchmen) captive and burnt several outposts. The leaders of the 'bundh' are said to have taken shelter in the Darshanigudda ranges and at times escaped into neighbouring Goa territory. There are also references to a formidable fight at Dandeli and one at a Somalinga temple. These activities continued for several months and the British eventually sentenced some of them. The Portuguese also deported more than 100 of these insurgents along with the Sawant brothers and their families to Timor in the East Indies. Gunaba Shenvi, Siddi Bastian, his brother Anna Saheb and the three Phadnis brothers were still at large and in July 1859, the British offered rewards of Rs. 1000 each for their arrest. Chintoba Phadnis and Siddi Bastian were eventually killed in an encounter at Jagabet. In India, Karnataka has the largest concentration of Siddis. According to latest estimates there are around 3,700 Siddi families in the state with a total population of 18,000. Other Siddhi populations in the sub-continent include around 10,000 in Gujarat and 12,000 in Hyderabad. A few hundreds are also in Lucknow, Delhi and Calcutta. Fewer than 1,000 “Ceylon Kapris” live in Sri Lanka. A Y-chromosome study by Shah et al. (2011) tested Siddi individuals in India for paternal lineages. The authors observed the E1b1a haplogroup, which is frequent amongst Bantu peoples, in about 42% and 34% of Siddis from Karnataka and Gujarat, respectively. Around 14% of Siddis from Karnataka and 35% of Siddis from Gujarat also belonged to the Sub-Saharan B haplogroup. The remaining 30% of Siddi had Indian or Near Eastern-associated clades, including haplogroups H, L, J and P.
According to an mtDNA study by Shah et al. (2011), the maternal ancestry of the Siddi consists of a mixture of Sub-Saharan and Indian haplogroups, reflecting substantial female gene flow from neighboring Indian populations. About 53% of the Siddis from Gujarat and 24% of the Siddis from Karnataka belonged to various Sub-Saharan macro-haplogroup L sub-clades. The latter mainly consisted of L0 and L2a sublineages associated with Bantu women. The remainder possessed Indian-specific subclades of the Eurasian haplogroups M and N, which points to recent admixture with autochthonous Indian groups. Similarly, Shah et al. (2011) observed that Siddis in Gujarat derive 66.90%-70.50% of their ancestry from Bantu forebears, while the Siddis in Karnataka possess 64.80%-74.40% such Southeast African ancestry. The remaining autosomal DNA components in the studied Siddi were mainly associated with local South Asian populations. According to the authors, gene flow between the Siddis' Bantu ancestors and local Indian populations was also largely unidirectional. They estimate this admixture episode's time of occurrence at within the past 200 years or eight generations. Like Siddhi populations across the sub-continent, Siddhis in Karnataka also have remained isolated, and economically and socially neglected. In 1984, at the instance of the Secretary of the Rural Welfare Trust, Dandeli and few others, an "All-Karnataka Siddi Development Association" was formed to bring Siddhis together and work for their integrated development. K. V. Subbanna, the Magsaysay awardee also made some efforts in this direction with his Ninasam. On January 8, 2003, the Union government brought the Siddis under the list of Scheduled Tribes with a view to empowering them constitutionally. Further, policies to provide homes for homeless Siddis, water facilities, education, employment opportunities, roads, electricity, mobile hospitals 2 acres (8,100 m2) of land to each Siddi family and the right to collect forest products were also endorsed by parliament. It is hoped that proper implementation of these policies would go a long way in helping the Siddhi community enhance their social and economic status. Internationally too, awareness of sub-Saharan African diaspora in the east has been limited. In 2006, however, 'The African Diaspora in Asia'(TADIA), a UNESCO backed initiative has also evinced interest in the rehabilitation of this tribe. Headed by Prof Angenot of Brazil, it has become the academic link between the Siddis of Karnataka, Gujarat and Andhra Pradesh and other research scholars. It aims at involving academic research, promoting cultural exchanges and raising funds for education and employment generation programmes for the Siddis. According to B. G. L. Swamy, a renowned Botanist, seeds of a huge tree, the Adansonia digitata Linn., which is a native of Africa, were probably brought by the Siddhis. A popular Kannada film of the 70s, Bhootayyana Maga Ayyu, has a Siddi playing the role of Siddi Byra in the movie. 1 2 3 4 5 Shah, Anish M.; et al. (15 July 2011). "Indian Siddis: African Descendants with Indian Admixture". American Journal of Human Genetics. 89 (1): 154–161. doi:10.1016/j.ajhg.2011.05.030. PMC 3135801 . PMID 21741027. Retrieved 18 December 2012. 1 2 3 4 5 Sadiq Ali, Shanti. 1996. The African dispersal in the Deccan: from medieval to modern times. New Delhi: Orient Longman. 1 2 3 4 5 Devika Sequeira. "Near forgotten, Siddis to meet". Deccan Herald. Retrieved 2007-07-19. ↑ "The Siddhi Community". K.L.Kamat. Kamat's Potpourri. Retrieved 2007-07-20. ↑ "The Raja had surrounded his house with African bodyguards"
1 2 Beeranna Nayak Mogata. "Empowering the Siddi community". Deccan Herald. Archived from the original on 2007-09-29. Retrieved 2007-07-19. Sadiq Ali, Shanti. 1996. The African dispersal in the Deccan: from medieval to modern times. New Delhi: Orient Longman.